After the wonderful dinner last night, we were expecting an equally good breakfast, and we were not disappointed. Since Greg had already purchased food, we didn’t need to take anything from the hotel. I appreciated the plentiful coffee that was served instead of the demi-tasse that was usual. Before locating the Camino out of town, we stopped at a shop where Greg had purchased my shell. The owner was English-speaking and very welcoming. Greg bought a T-shirt with a yellow arrow and then we set out. Just up the block from our hotel was the Cathedral Santa Marta. It was under construction, so we couldn’t get inside to see it. 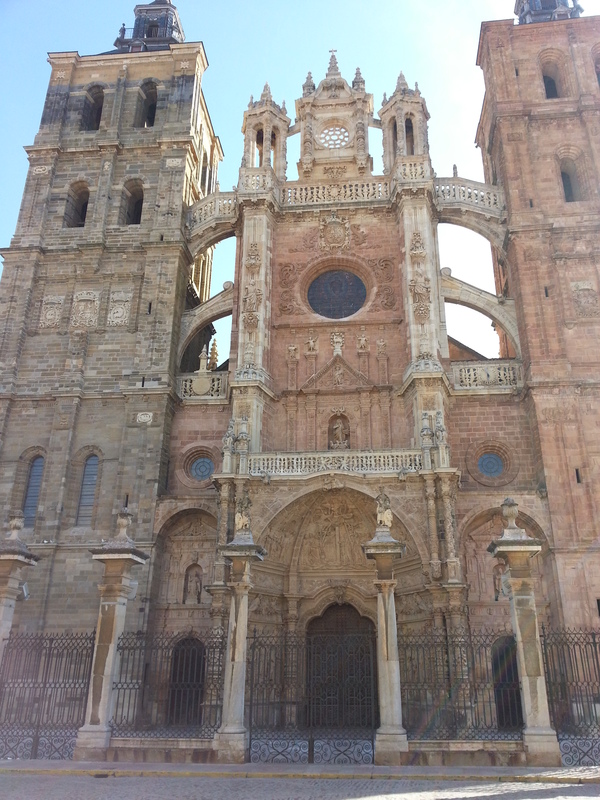 As we were picking up the Camino, we both remarked that Astorga really appeared to be a neat town and definitely would have been a place in which we could have stayed for another day. 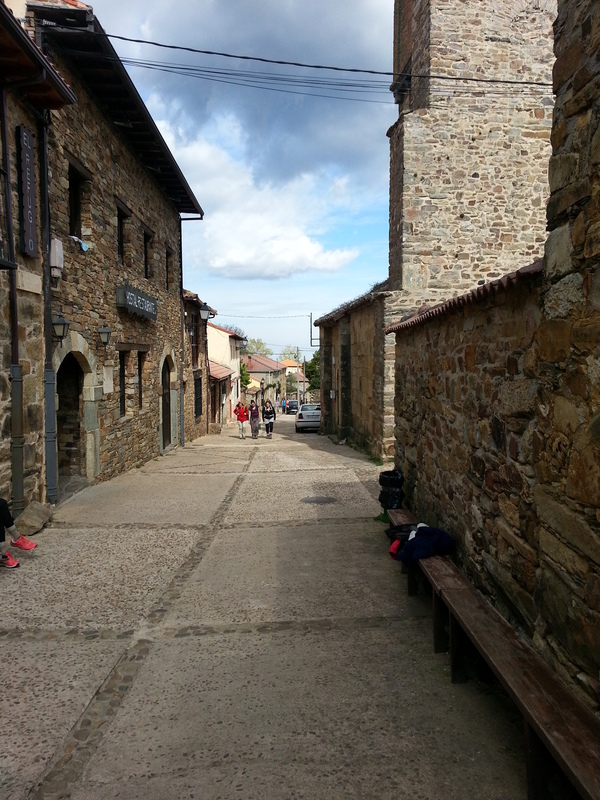 Some towns, we were anxious to leave (El Burgo Ranero? 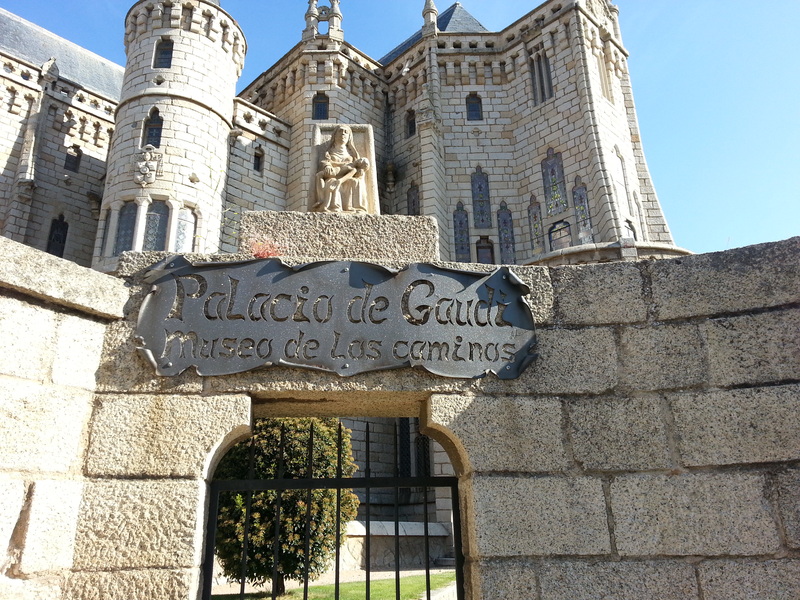 ), but not Astorga. 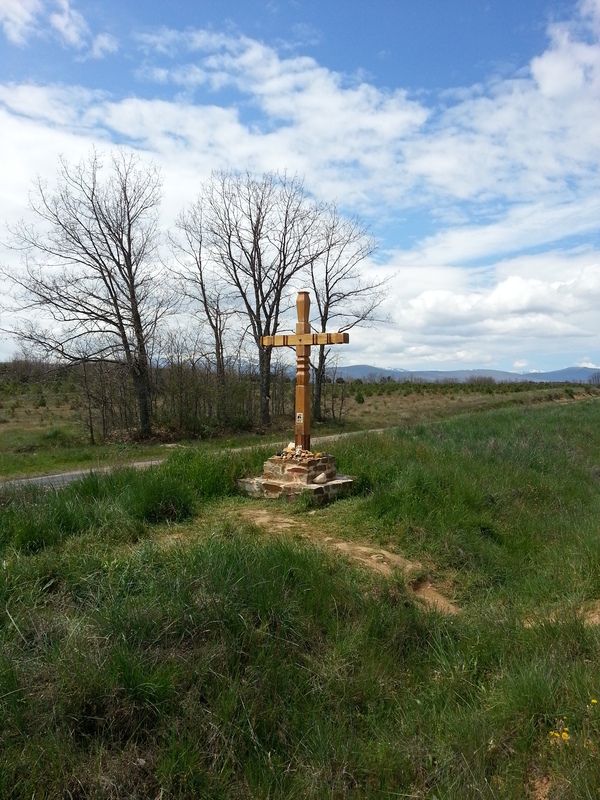 We headed to the northwest of town and picked up the Camino through the Puerto Obispo and soon we were across the A-6 and back in rural Spain. The first town we stopped at was Murias de Rechivaldo. 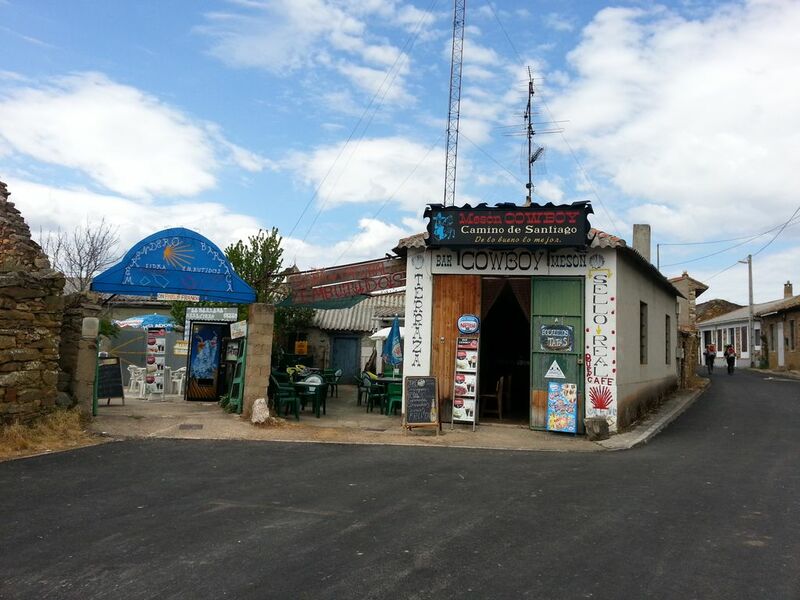 Here, we ran into Phyllis while we were having a snack, and while we were chatting with her, Richard came by and told us that he was taking the detour to Castro de Polvares to see the classic Maragatos village. Then he was off, and Phyllis stayed with us for the rest of the day as we climbed up to Santa Catalina and El Ganso before reaching the heights of Rabanal. 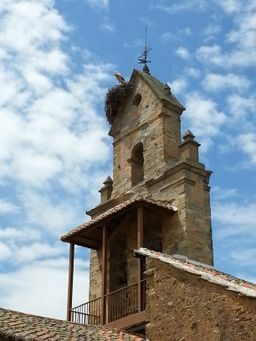 Along the way, we saw several storks in the fields and noticed that they had built enormous nests on the tallest structures in town. In El Ganso, we ran into one of these nests. After a long, strenuous day of significant climbs, many of which were on rocky paths, we arrived in Rabanal, 3,600 ft up in the mountains. Rabanal is a centuries-old town on a hill lined with old stone walls and filled with pristine cobblestone streets. 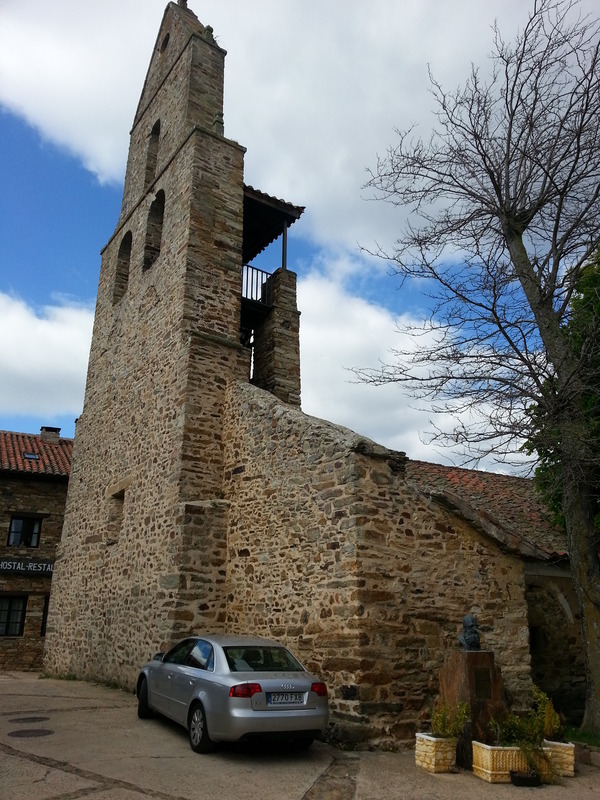 We stayed at La Posada de Gaspar, at the top end of town. Our host was jovial and welcomed us graciously. The main bar/lobby area is open to the top of the building with the rooms fanning off around this open area. We got settled in quickly, and I, as was my usual penchant, went down to the bar for a drink until dinner was served. While sitting at the bar, I heard an American woman arguing with the host about calling a baggage service to pick up her bags the following day. He did not want to call the service for her, but was willing to give her the number for her to call. She was quite obnoxious about it, but after a while he relented and made the call. Greg came down and was intent on going on one of his forays into the town to find food. 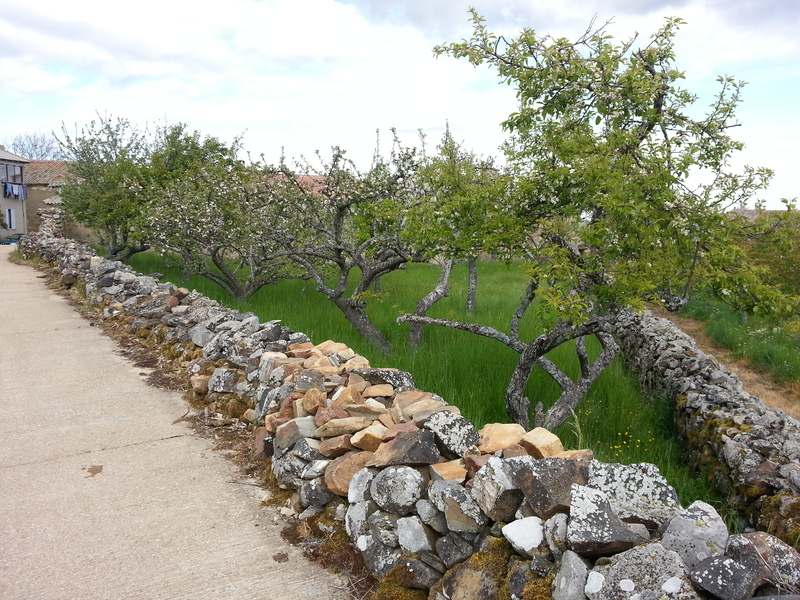 I went off in the opposite direction where it was flatter (blisters really hurting) and took some pictures of the beautiful stone walls that lined the adjoining orchards. We had left Phyllis at her hotel earlier upon arriving in Rabanal. She told us she would join us later for dinner at our place if she wasn’t too tired. That evening we had another good dinner. Phyllis never did make it. We didn’t see Manfred either, and he must have stayed at another hotel in town. It didn’t take long to get to sleep, as usual.